Working in cold storage isn’t exactly a walk in the park. No human body can easily adjust to freezing cold temperatures. Therefore, you need reliable protection that will keep you warm all day long. Working in cold storages and in freezers means exposure to extreme cold, demanding a lot of the worker, both physically and mentally. In order to increase comfort and to minimise heat loss from the body, we’ve designed the best clothing. Numbness in the fingers and toes and reduction in dexterity, decreasing overall muscular activity and attention deficit, are among the initial effects of exposure to low temperatures. The first reaction of the body to cold is shivering, but a shivering worker becomes ineffective. 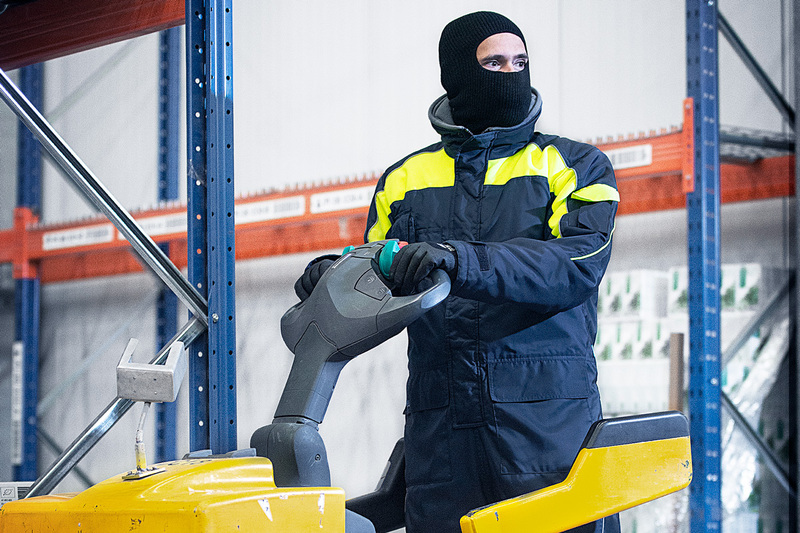 Sioen R&D have been developing garments that protect people working in cold storages and freezers. The Nibas is our cold storage bomber jacket with quilted lining that protects you to temperatures of -40 °C. The inner collar is fleece-lined. The sleeves are equipped with knitted cuffs, a practical thumb hole and touch and close sleeve narrowing. For your comfort, the elastic waist can be narrowed using press studs on the sides. The shoulders are reinforced so that this bomber jacket is a durable and practical protective garment. Work effortlessly in extremely cold temperatures with our practical and comfortable Olmet cold storage coverall. With an inner fleece-lined collar and a fixed quilted lining you won’t easily get cold wearing them. The knitted cuffs in the sleeves have a thumb hole for your comfort, the sleeve narrowing and the adjustable hem at the leg ends ensure that every bit of wind is kept out. The Olmet is provided with knee reinforcement for your comfort, elastic narrowing in the back and zip fastening with flap and touch and close fastening at the bottom of the leg. In addition to the five handy pockets, including one inside pocket and one sleeve pocket, this coverall can be fitted with a hood (available separately). The excellent product knowledge and creative design, obtained through the exhaustive handling and testing of our products, allows us to develop revolutionary new garments. Every day we live up to our company slogan ‘protection through innovation’. The knowledge, state-of-the-art testing equipment and thorough expertise in the field of norms and standards make our inhouse R&D team highly professional. This always results in the best garments. Supplied by experts, for experts.